Scientific observations indicate that global climate has changed in the past, is changing now, and will change in the future. What will happen? The Earth’s climate is influenced by many factors on many time and space scales. Interactions between the oceans, atmosphere, land, cryosphere and biosphere known today are far too complex for even the best scientists to determine via discussion or pencil and paper. Fortunately, these interactions are governed by a finite set of physical laws which have been uncovered over centuries of scientific investigation. Like most of physics, these laws have a particularly elegant mathematical form – a form that makes them amenable to quantitative calculation. 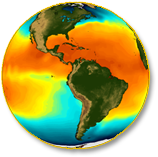 Because the consequences of climate change could be wrenching to world civilization, future climate prediction has become one of the most active areas in all of the atmospheric sciences in recent decades.